This is my best guess for kickoff times this season. Times and networks in bold are confirmed. Nov 3 - It takes a possible night match up off the table, as the only other SEC game that evening will be an SECNetwork stinker (I'm liking LaTech vs Mississippi State for that) to go against the 8pm game. We could end up as a 3pm SEC Network game if Kentucky (or both Kentucky and UGA) are bad. 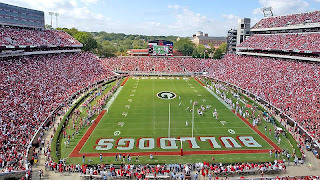 Nov 10 - Looking at that weekend, I still think Georgia at Auburn will be the top match-up. Unless something goes way off the rails, this is the closest thing to a lock I can predict for that late in the season. UMass could be played in the noon, 3:30 or late slot. I have no idea. The thing about putting Tech at night is dependent on them either being pretty good or Johnson fighting for his job. If he's done or looking done, I'd lean that game earlier. There are only four SEC games for inventory that weekend, so after Auburn at Bama is off the table for the CBS game, those other three games are SEC Network games. Your mileage may vary, though.